I guess you all heard about Snowmageddon in Atlanta last week. Two inches of snow plus crazy Atlanta drivers equals the worst traffic jam in recent history. In all fairness, Atlanta doesn’t see much snow and locals just don’t know how to drive in it. For that matter, we (read they) don’t know how to drive in the rain, either. Fortunately, we made it home without incident and hunkered down by the fire for a couple of days. This thin-blooded southern boy doesn’t cope well with temperatures in the teens. As I sat on my sofa, notebook in lap, I gazed out at our frozen backyard and dreamed of warm weather. My thoughts turned to food and I envisioned a hot summer day, grilling and dining outside with friends. One thought led to another and I started thinking about one of our favorite summer lunches: chicken salad. I had already planned a post for this week that required chicken stock. These days, packaged chicken stock works well for most recipes I develop. However, I needed a super rich stock for the recipe, so I killed two birds with one stone (pun intended) and boiled a whole chicken with vegetables. I got the stock I needed and I had a cooked chicken for making the salad. If you don’t have time to cook a chicken, a rotisserie chicken, available in most supermarkets, works well for this recipe. Jim loves fruit in chicken salad, so after an assessment of the fridge and pantry I gathered grapes, dried cherries, and hazelnuts and was off to make a very special lunch. Mix all ingredients together. Serve over a leaves of lettuce. It snows and you think of salad? You are a southern boy. :). This is a beautiful salad and when the weather warms up I would love to make it. I’ve had chicken salad with grapes but never cherries and hazelnuts. Sounds wonderful! Hoping we are done with snow and ice and all that stuff till -forever! This is one gorgeous salad – Bill, love your plating – with the salad surrounded by purple lettuce – or is that a red onion? This winter has been brutal. I like cold weather, but enough is enough! 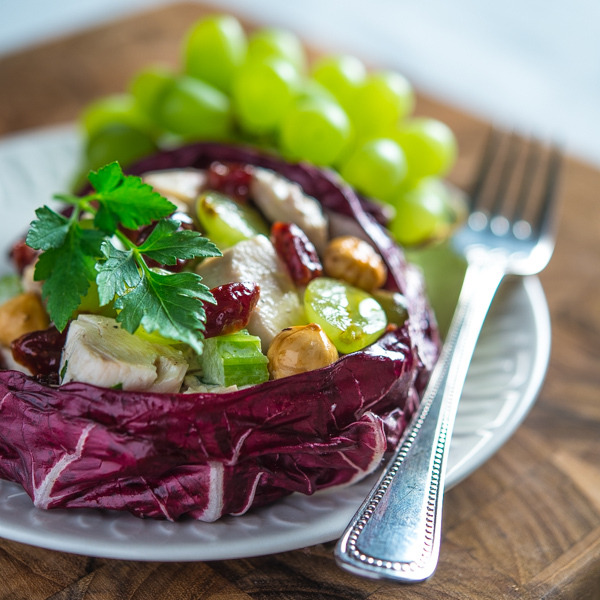 I don’t often use fruit in chicken salad, but it’s a great idea — the grapes in particular. Yours looks lovely — love the nice light on the picture! BTW, have you ever tried the Better than Bouillon brand of stock base? (It’s usually in the soup aisle of your supermarket). Really easy to make exactly the strength stock you want with that. There are other good stock bases out there too (and a lot of restaurants use them), but that’s one I’m familiar with that’s widely available. (BTW, I have no connection to these folks — I just like their product.) Anyway, good stuff — thanks. This is so gorgeous! It looks like a purse of heaven filled treats! Love!